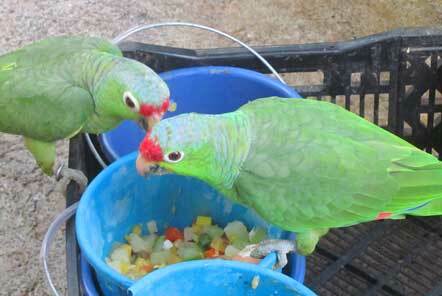 During my exciting trip to Costa Rica I visted the Wildlife Rescue project. I was met at San Jose airport by the project’s lovely driver Rodney who drove me the 3 hour journey to the placement. It’s such a nice way to get a feel for the country’s landscape. There was some pretty heavy showers on the way but these are the reason that the country is so green and lush. On arrival I was met by the project team, shown to my room and then given a tour of the project. The tour is a great way to learn more about the animals that you will be helping to care for. These include sloths, titi monkeys, capuchins, spider monkeys, marmosets, tamarind monkeys, parakites, parrots, kinksjous and coatmundis to name a few. You get to learn about where these animals are found in the wild and the backgrounds of the specific animals and why they have ended up in the sanctuary. Many have experienced injuries which mean it is not possible for them to be successfully rehabilitated and released, others have been kept as pets for too long to have the skills needed to survive on their own in the wild. It is sad that so many animals are in this situation but it’s great to know that you are helping to provide these animals with the optimal level of care so that they can remain happy and healthy in the sanctuary. That evening I headed into the local town with volunteers and the vet technician for burgers. It was great getting to know them and hear about why they had chosen to come to Costa Rica to assist at the project and to hear the highlights of their time there so far. It’s always great meeting people from all over the world, with such different backgrounds and experiences as you automatically have more in common than you think as you all ended up choosing to come to the same project. The next day started with fruit and banana pancakes – always a good start to the day! The first job of the day is generally always food preparation, so I went with Oseas (head of the sanctuary) and the other volunteers to prepare the food for the first feeding round of the day. 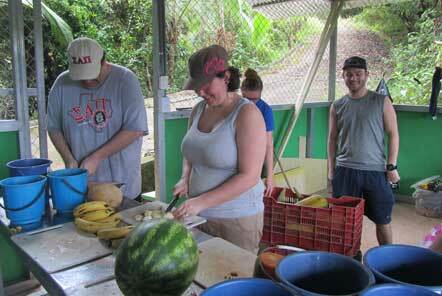 This involves cutting mostly fruit and vegetables for the animals. It’s interesting to learn about the various animals’ diets and requirements. The food needs to be cut into different sizes depending on the species and some of the vegetables are cooked so they are softer to eat. It’s then time to take the food out to the animals. There are some enclosures that volunteers are allowed to enter in order to feed the animal, others which are fed without having to go into the enclosure and some that are only fed by the staff. One of the great things on this feeding round was seeing four of the titi monkeys which were on ‘soft-release’, meaning that they were no longer housed in the sanctuary, but had been released on site so that they could be closely monitored to see how well they were able to fend for themselves. It is hoped that more of the titi monkeys would be able to join them soon. It’s great watching them enjoying their freedom but still trying to get an easy meal by stealing some of the food out of the buckets if you’re not looking! In between jobs I joined another tour and this time when we reached the tamarins’ enclosure, they seemed worried by something and kept looking up above their enclosure. We looked up and couldn’t see anything to begin with and that’s when one of the volunteers spotted something in the trees, “it’s a sloth!” Initially we didn’t think this would be the case as wild sloths had only been spotted on the sanctuary grounds once before, but it was, it was a 3 toed sloth in the wild! This was such an exciting moment and an important development as it means that it could be a good habitat for 3 toed sloths, as this one had opted to live in the area. 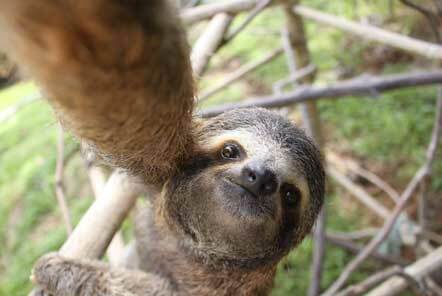 This was an indicator that there could be the potential to release sloths in the immediate area rather than them having to be taken to alternative release sites. 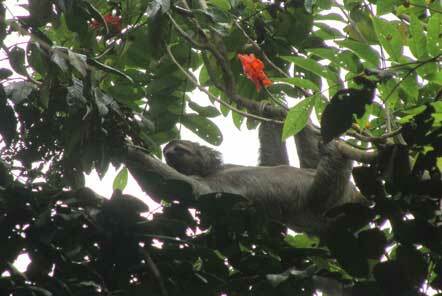 It was actually especially good timing to have seen a wild sloth in the area. The project had a previous member of staff who had gone onto train as a forestry engineer surveying the surrounding land to determine if it was a suitable environment for the release of sloths in terms of available diet and number of predators, so he was interested to see our photos and hear the news over lunch. Lunch at the project is a great time to catch up with other members of the team to find out how their day has been and what they have been up to so far. 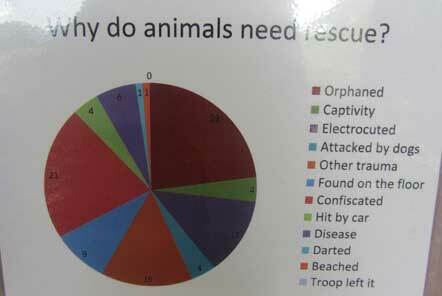 For example the vet and vet technicians always have stories to tell. You’ll also see the “sloth mum” regularly who often carries young sloths in a sling as they are comforted by the warmth and feel of a heartbeat close to them (in a similar way to the way they would attach themselves to their mum). After lunch it was time for more food prep and feeding rounds. There was a moment on this feed round where I was worried that I had let a parakite escape whilst holding the door for Oseas, but I was very relieved when he confirmed that it was actually a wild one that regularly comes to visit during feeding times! That afternoon as I was heading back to the volunteer house for a shower, I heard a message come through on my radio that there had been a call from a hotel in town reporting that a baby sloth had fallen from its mother and was not moving. This is unfortunately quite common as young sloths have to hold onto their mother tightly in order not to fall. For those which are small, weak or unwell, often they do not have the strength to do this and can fall (sometimes from quite a height). The mothers then have a decision to make; do they risk coming down to retrieve their young, risking their own safety in the process and obviously for a sloth, this is not a quick job, or do they leave their young, as the fact that they have fallen may be an indicator that the baby was not strong enough to survive in the long term and animals can often sense this. Particularly in areas where there are people around (such as in the grounds of hotels), the mothers often choose not to come down as they see the people around as too much of a risk. This to me was a once in a lifetime opportunity to view some of the fantastic work that the project do, so I ran up the hill to the vehicle and joined the rescue. When we arrived, the hotel staff informed us that the baby had not really moved since they found her, at which point they put her into a box with a towel in an effort to protect her. We took her back to the clinic where the vet was waiting, ready to check her over for skin diseases, respiratory problems and check her temperature as hypothermia is a big risk. She was put on oxygen so the vet could continue to monitor and care for her throughout the night. The fact that she was so sick and that her mother had rejected her meant it was unlikely that, even if she made a quick recovery, that she could be reunited with her mum. Instead the best outcome for her would be to recover and then be released from the rehabilitation area at the project. I could see why this can be quite an emotionally challenging placement as the animals who come in having been rescued rescue do not always survive, and despite the team’s best efforts, unfortunately the sloth died at 3am the following morning. However it can also be incredibly rewarding, the following day a titi monkey and toucan were both released which is the ideal outcome for the animals. There’s always something going on at the project; the next day a call came through that a howler monkey needed to be rescued so the vet headed out to collect him. Unfortunately two howler monkeys had been electrocuted, one had died immediately, and the other had survived but had a bad injury to its arm. After the initial check, the vet was confident that he would be able to be released back with his troop within ten days. My final role was one I was very honoured to be a part of. 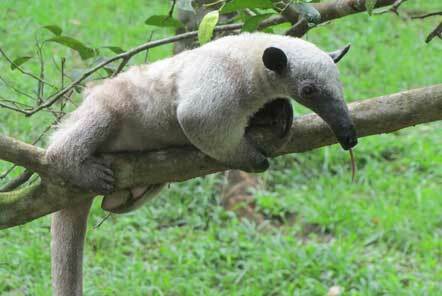 The sloth mum, who is also in charge of the nursery area asked myself and another volunteer to monitor Al the 4 month old anteater while he spent time exploring and climbing a tree. This was to allow him time to develop these skills and to feedback to the staff about his behaviour such as his ability to climb and forage for food as this information is very important when considering the timing and suitability of specific animals for release. It was great watching him climb and use his incredibly long tongue to catch ants on the branches whilst also watching the hummingbirds close by, I couldn’t think of a better end to my visit! Following my time at the project, I spent a few days exploring the Manuel Antonio National Park which is not far from the project, there are some beautiful beaches and nature walks so I’d recommend taking advantage of these in your free time or after your placement if you have some additional time to spend in Costa Rica.